Say what? You’re probably thinking, “Umm, Julie. That table does NOT look thrifty.” I totally agree. It doesn’t, but that’s the point. No one needs to know, although I really enjoy telling them anyway. Expensive things don’t impress me. What impresses me is beauty, and I don’t care how much it cost. 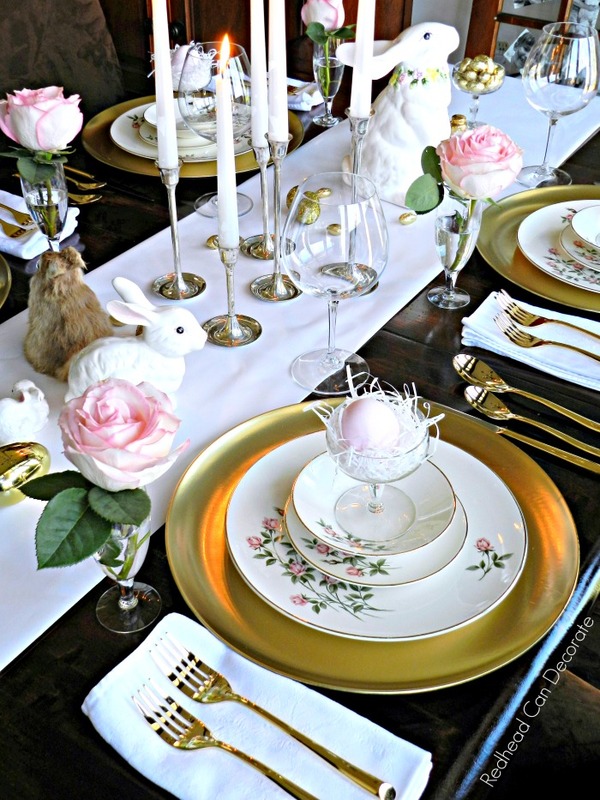 Okay, so…how did I create this beautiful golden Easter table on a budget? Lets start with the plates. My youngest and I visited the thrift store a couple weeks ago and I usually start off at the plate section. 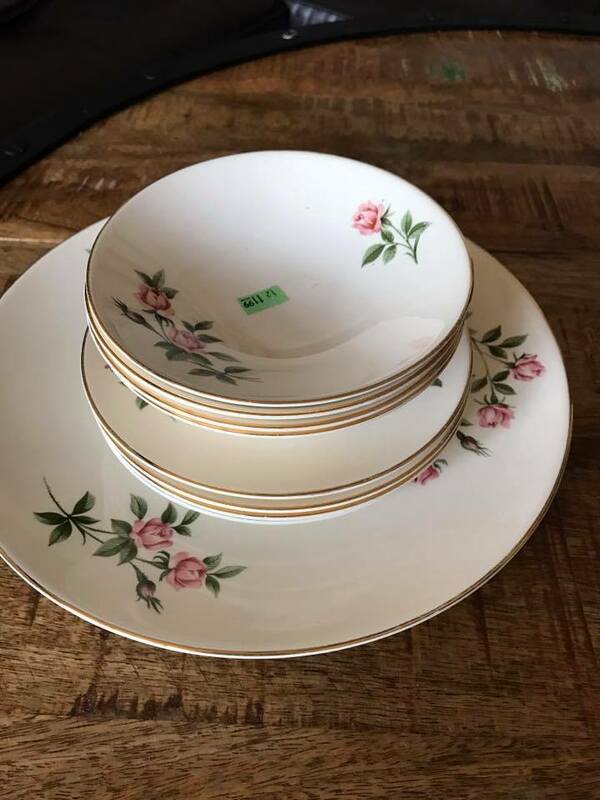 I nearly lost my eye balls when this set was sitting there gently gazing at me with those golden lines of trim and pink roses. I was shocked to see on the sticker “$11.99 set of 12”. I quickly checked each piece and only found 1 tiny chip. I mean really tiny. Like who cares tiny. I mean, $11.99? Someone made a mistake. Thank you, mistake maker. When I got home I played with the plates and just couldn’t believe how beautiful they were. I knew they would make a beautiful tablescape (and we will be using them daily, too). So, make sure you check the plate section when you visit any resale/thrift store. Okay, so I had the plates, but they were rather small, so I decided to DIY those gold “chargers” that are placed under the plates. 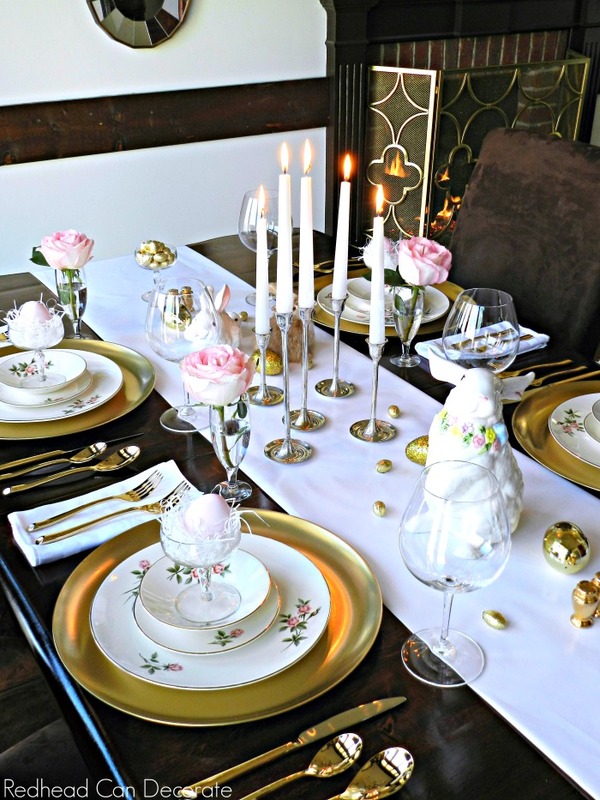 Notice how they add depth and even a little vintage glam to the table? I really want to tell you right now how I made those, but I promised some folks that I would share that tutorial in our “Thrifty Style Team” series coming up on the 2nd Wednesday of the month. So, stay tuned for that simple DIY charger idea that anyone can do. You won’t believe it, but I also found the champagne glasses that the pink eggs are in at the thrift store as well. In addition, I found the big ceramic bunny on the left, the silver candle holders, and the tiny gold salt & pepper shaker sets all at the thrift store. 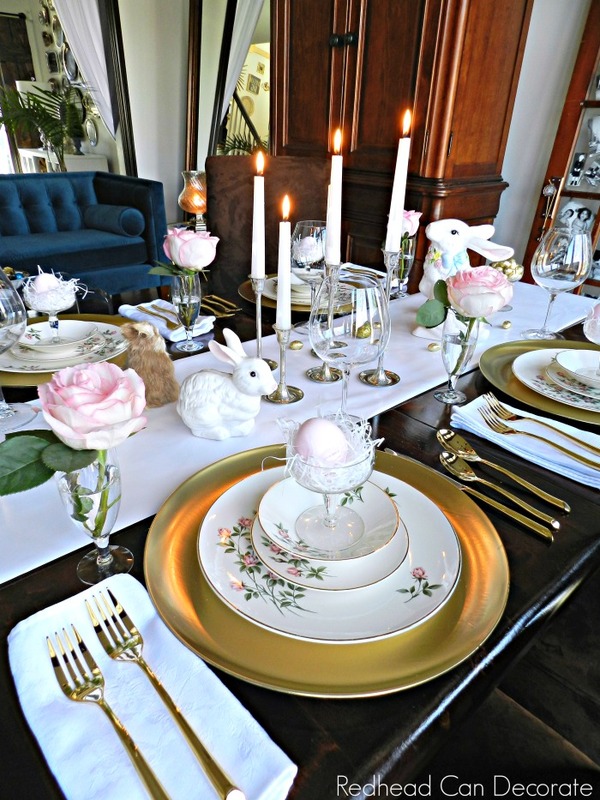 The pretty champagne glasses with the pink roses I inherited from my grandfather, the cloth napkins from my Mom (thank you, Mom), and the other bunnies I have collected over the years (see source list below). There is 1 item that I did splurge on. SHH! Quiet. Lets whisper and my husband won’t even notice. He doesn’t care anyway. Yep. The gold flatware. I’ve been stalking gold flatware for months now. I finally found the most beautiful set on line and my source is below. I am in love with how beautiful the set is. I can pass these babies down which make them so special. I think you might be able to see me in those forks. Hope not, lol. Did I miss anything? Oh, the paper. I found that at the dollar store (along with the gold foil chocolate eggs) over by the wrapping paper. They have pastel colors, too. 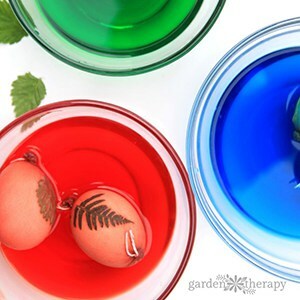 I should also tell you that I colored the pink eggs with just a little warm water and 2 drops of red food coloring. Boom, done. 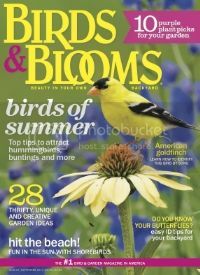 If you scroll down you will see all of the beautiful Spring time ideas created by many talented Bhome bloggers. You’ll also notice that we are giving away a free gift! 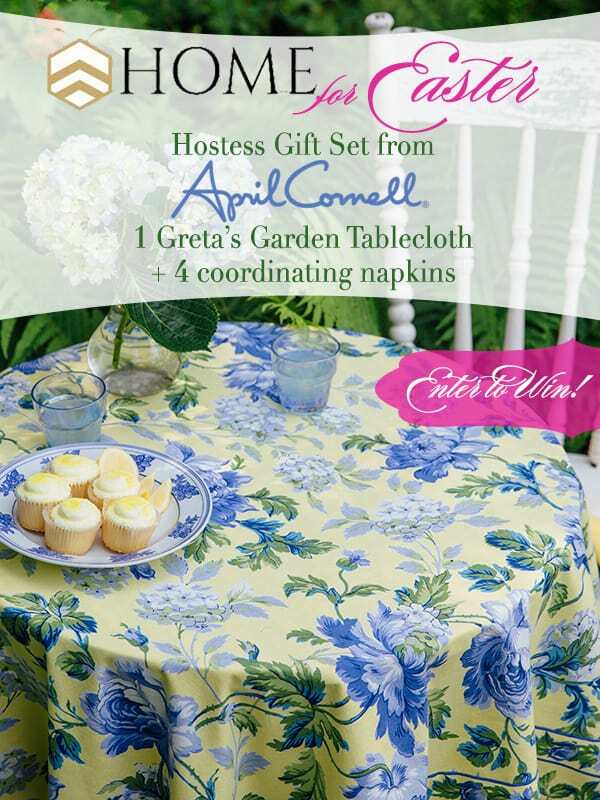 Don’t forget to enter to win April Cornell’s beautiful hostess set (1 tablecloth & 4 coordinating cloth napkins). 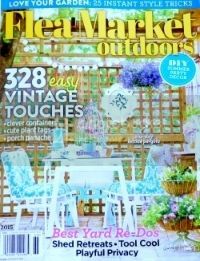 To enter, visit April Cornell’s website HERE, then come back and tell me your favorite pattern in my comment section. That’s it…you are then entered. This giveaway is open to US & Canada residents excluding Quebec and where prohibited. Winner will be notified by e-mail. Good luck! You can also CLICK HERE for another giveaway I am hosting! Beautiful beautiful table Julie. Wow, you certainly scored on the dinnerware!! They were just waiting for you to give them a great home and glam them up!! Great find on those champagne glasses too!! I’d say a table that you certainly put together on a great budget looks like a million bucks!!! Can’t wait to see more of the fireplace screen! Have a great week!! With my last name I should absolutely have those dishes! What a gorgeous find. Greta’s Gate is my favorite. Blue and yellow combination is a weakness. Such a pretty table. Thrift store finds are the best! Julie I have to say you always have the prettiest tables for the holiday. Those dishes are a score!!! 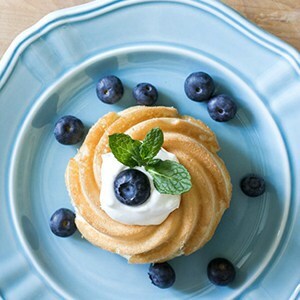 I love thrift store dishes…and these are lovely. Hope you aren’t snowed in! 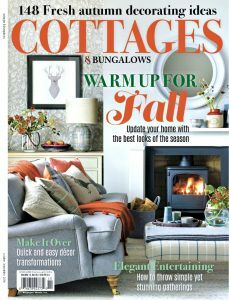 Hi Julie, what a nice surprise to find your post while taking short break from my purging and organizing in craft room. About doggoned time too, what a mess. Hubs going to make more shelves on walls out of part of old computer desk we took out of room. Your table is exquisite Julie, what wonderful find in the dishes and tableware, love that gold, looks quite expensive sitting by your “new” dishes. Everything is very perfect, so glad you found dishes at good price, you have great eye. Will look forward to hearing about gold chargers and new fire screen. Such gorgeous merchandise on April Cornell, think Dandelion Dreams is my favorite. 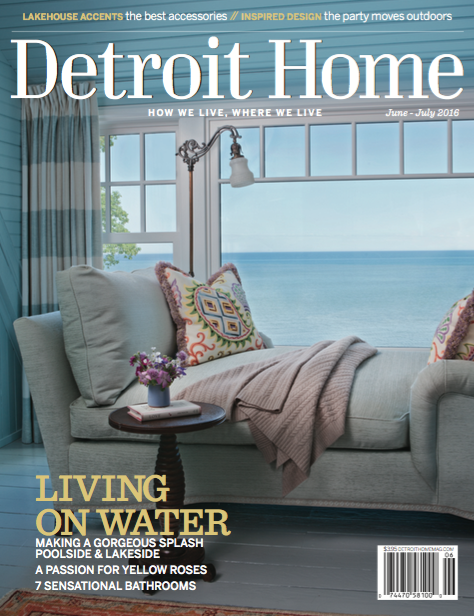 Our home is decorated cottage with light grey, aqua, coral and some light greens with coral in master bedroom. I won’t tell you what it’s like here in Western CO, Sorry about your extended Winter. We’ve lived in pretty cold in MT. with lots of snow. 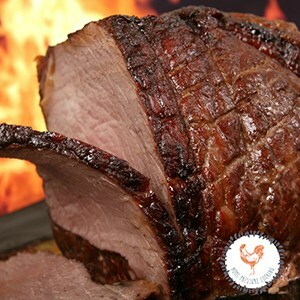 Enjoy your wonderful table and rest of week. How fun to have found fun dishes you can simply use. $12 for all those dishes?!! I feel like using my China for every day. My girls won’t want it. Why shouldn’t I enjoy it??? 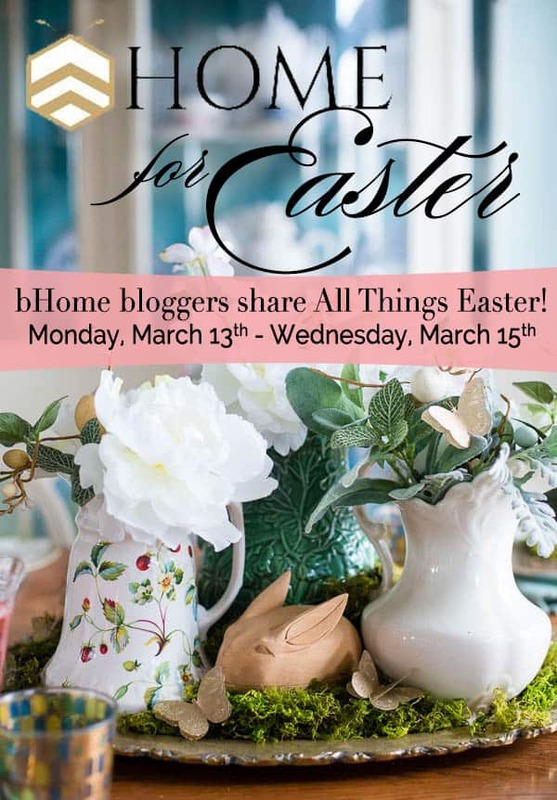 This looks fun with a mix of new, heirloom, and thrifted pieces plus a collection you’ve been adding to (rabbits!). 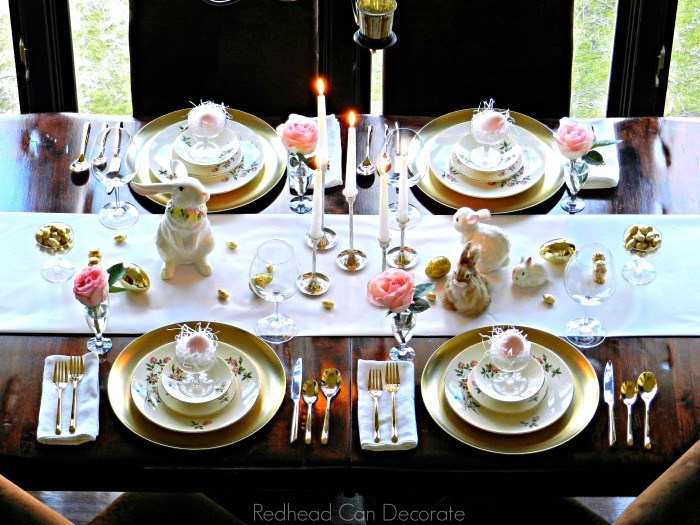 Your thrifted Easter table is lovely, Julie, and those plates…oh my goodness! You put everything together perfectly. first, i am never that lucky to score such a find at the thrift store. so pretty. second, I did spy that beautiful sofa! Thank you, Laura! 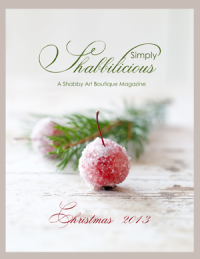 Did you get one yet? Beautiful!! Love all the different textures and styles. I LOVE THE BASKET ROSE..
OMG Julie, your table setting is Gorgeous and such great thrift store findings. Me; I’m not quite as lucky. Thank you for this giveaway opportunity. Me I love the Greta’s Garden Tablecloth from April Cornell’s website. Perfect color to go in my dining room. You have such a great imagination and style. Well done! Beautiful table 🙂 You are so creative!!!! Julie I notice in the background your photo’s in the old window/door! Would love to here how you finished that item. I have 2 old windows that I want to work on if the weather ever warms up. Thank you for this chance! So many beautiful prints! I adore In Full Bloom Breakfast Oilcloth. 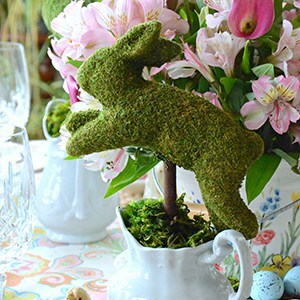 Love all the bunnies as well the overall tablescape. I need to try shopping at thrift stores. I agree about the gold flatware. It certainly perks up a table. Yours is beautiful. I loved the red pattern on the table for the website, I love bold colors. Thanks for sharing, just love all your projects. I love pink roses and confessed plate addict! Your plates are so pretty, I can picture them in so many different tablescapes. Sending warming sunshine your way from So.Cal. Thanks for sharing Julie. I clicked the link for April Cornell site and everything she sells is so beautiful! I think I’m going to place an order and purchase the Clara Bedskirt from the Home Attic sale catagory. 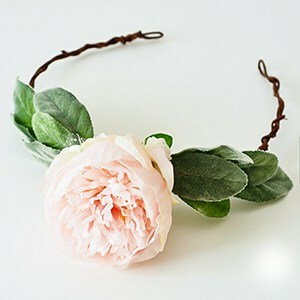 Everything is so feminine and romantic looking! My husband happened to lean over my shoulder and said they were too girly looking. By the way, I really enjoyed your Spring Easter table setting. It was so refreshing to see the day after the noreaster we had yesterday in the Northeast NY metro area. I also like thrift shops and yard sales for unexpected treasures and prices. So many beautiful designs, how to pick just one? I think I like the Tea Rose tablecloth the best, but also really love the one you feature and the Water Lilies (in blue). 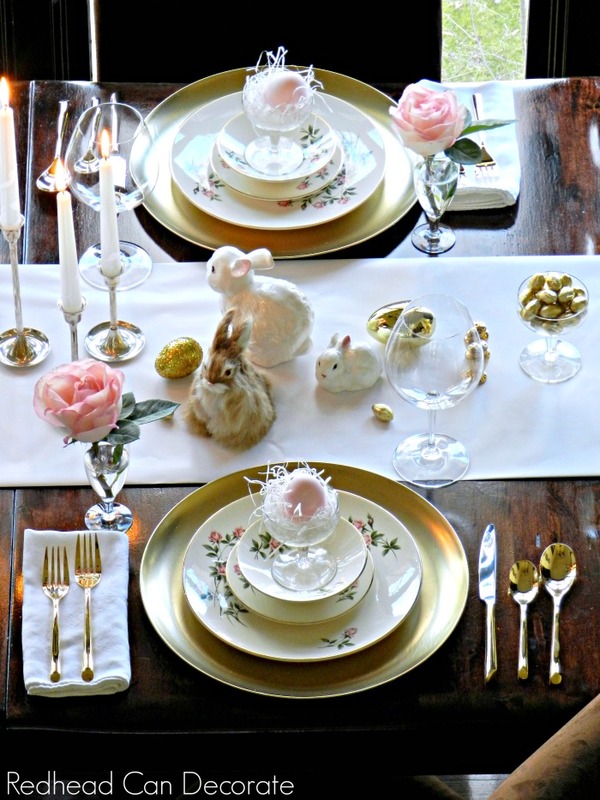 This Easter table is so lovely! 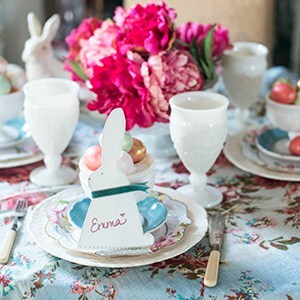 I loved everything from the table cloth to the the plates and little bunny figurines,so cute! It looks like a work of art and I would be proud to have guests come and have dinner,but secretly I wouldn’t like the table to be messed because I enjoy looking at it! Yowza Julie everyone loves your Easter table!!!!! I think it’s the most eloquent dinning table EVER!! You are so right when you say “the cost doesn’t matter”. When we can find a real bargain it just ‘makes our day’. I love the thrift stores. As for the tablecloth giveaway…..thank you for the opportunity; they are all wonderful but I guess if I had to choose one, it would be the red Felicitys Flowers. 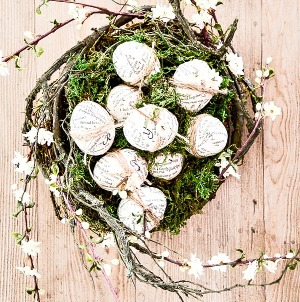 Wishing you and yours a beautiful, blessed Easter. Love your table Julie! I think you must have some super luck finding all those thrift store goodies, nice job! Just wanted to pass along a tip, I had gold flatware that I ruined by using the dishwasher to clean them, hand wash them and they’ll look great for years!! I really love the kashmere pattern, loving the purple color. Thank for the contest opportunity. Great tip Kaycee! Thank you for letting me know! Wow Julie, what a bargain find on those gorgeous plates… well done! 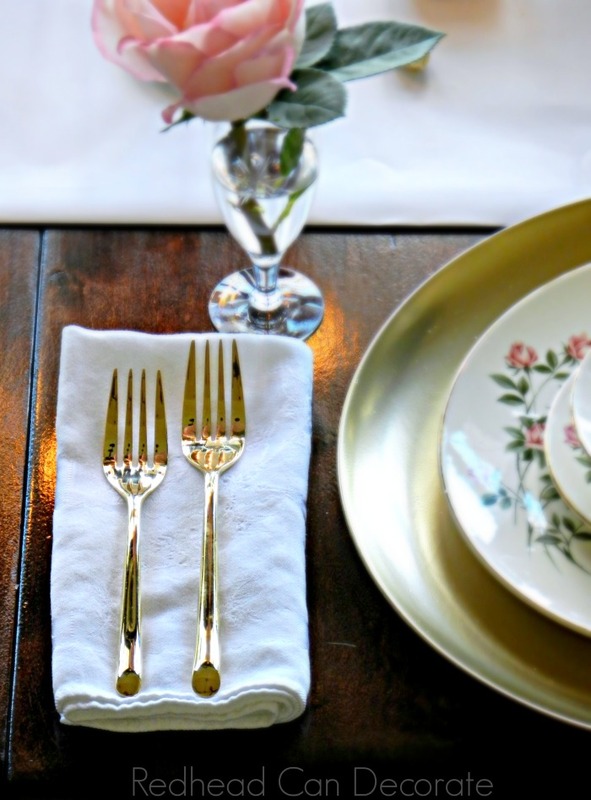 I love the whole table setting and the elegant feel of the gold features… oh, and that flatware is perfect. Hope Spring is just around the corner for you. Felicity’s Flowers is my favorite pattern from April Cornell’s web site. So many beautiful patterns to choose from. You are so inventive, I think it’s from being a native of Buffalo! Keep up the good work, don’t retire yet! Tablescape is beautiful! I love the April Cornell Victorian Rose tablecloth. So many I love, but the one I’d get the most use from is the Playful Paisley Tablecloth. Love your tablescape, beautiful. My fav April Cornell pattern is the colorful Fiesta Stripe! 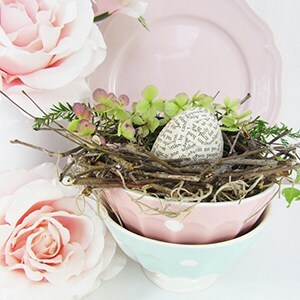 And I Love your Spring/Easter Tablescape! Wow, it’s hard to believe this fabulous table is thrift store finds. The table setting is adorable. What a find with the fanstatic plate setting. You truly found a steal! It truly was, Ivory! Thanks for stopping over today! Definitely the Fiesta Stripe. Will look brilliant with my Fiesta dishes. Thanks so much for the chance to win. Wow, you are a girl after my own heart with all the thrift store shopping and resourcefulness you have!! Greta’s gate is my favorite. Thank you. The new rose dishes and glassware are so pretty. 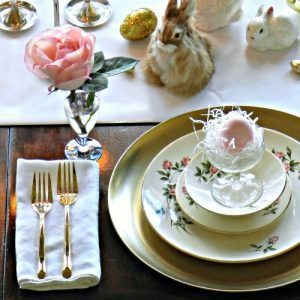 Your family will enjoy this table setting for Easter. Your table is beautiful! Thank for all of the great tips and ideas. Greta’s Garden and Folklore…..Thank you for the giveaway opportunity. Happy Easter! I like the Wildflowers tablecloth. Love the April Cornell website and really love the Willa Rose tablecloth! Hope your weather is warming up. 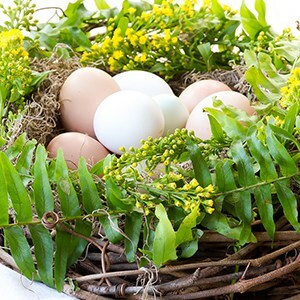 BEAUTIFUL Spring Time Easter table. WOW !! So FUN !! I see a trip to my local thrift storvAND the dollar store !! –thank you for the idea !! 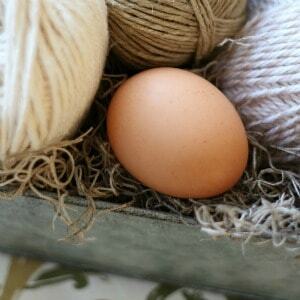 OH –and our craft store for white dyeable plastic eggs !! Hi Linda! 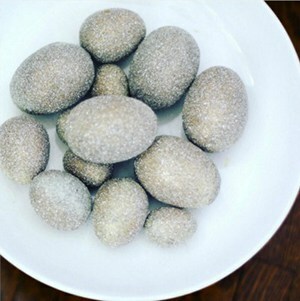 Wanted you to know that the pink eggs were real eggs. Thank you for your kind words! 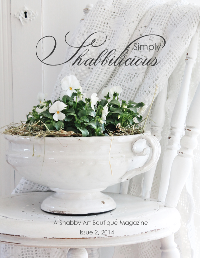 Beautifully created tablescape! The thrifted dishes were quite the find. The eggs in the stemware are cute! You have a beautiful home. Love the table. Can wait to pull out ALLLLL my Easter stuff. Your table setting is beautiful The pattern I like from April Cornell’s collection is Beautiful Blooms. Felicity’s Flowers! April Cornell had lots of beautiful patterns! I inherited set of vintage China from FIL when cleaning out his house and very vintage looking but see now how lovely they can be in a beautiful tablescape! I always need a touch of blue around me so Friendly is my April Cornell choice. 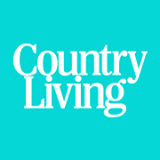 Love, love, LOVE how you help me decorate without breaking the bank! My favorite pattern was Vivian table cloth. I’m a sucker for anything with floral patterns. ? Wow Julie, your tablescape is fabulous. 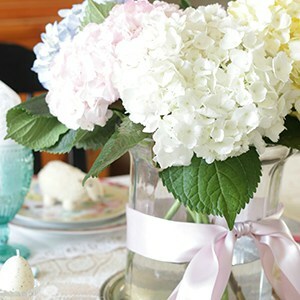 I love the cute little bunnies, the eggs, the pink roses, and your great plate set find, they are lovely. You always take my breath away with your creative designs. Thank you! 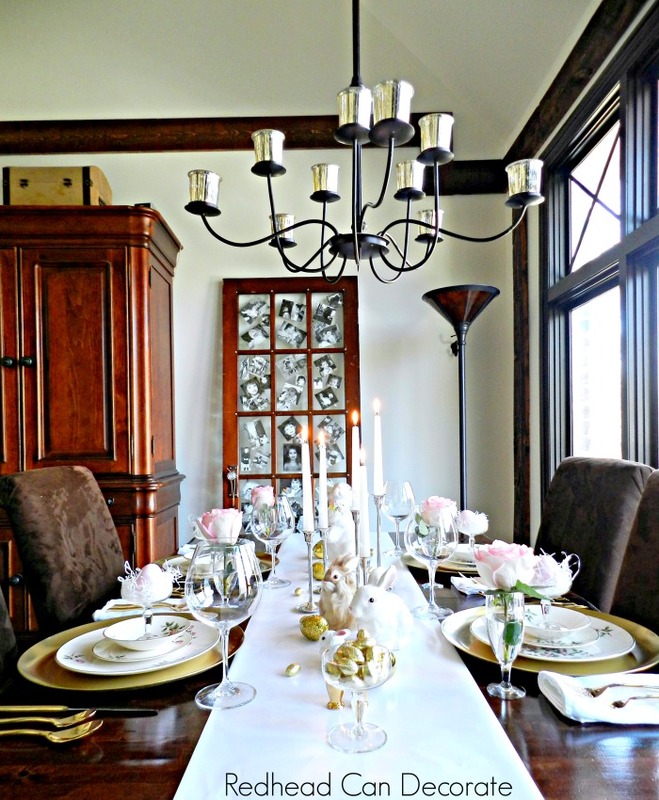 Thank you for sharing your beautiful table scape! If you tire of those lovely rose dishes, please send them to me!!! 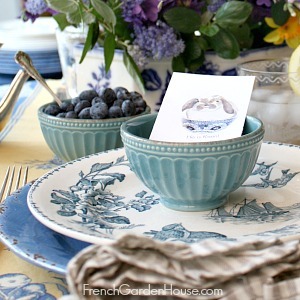 The Prairie Crochet table cloth would look gorgeous with my blue rose china (I really need it)! Your table looks amazing and I would have never guessed that it was thrifted. BTW – the furry bunny looks real from behind in the photo…lol.